The DonicC Dotec System is the first wood technology without awkward edges.Since the human hand does not have hard edges, DONIC wanted to develop a smooth blade without sharp edges. It was, therefore, important to ensure a completely smooth transition between blade and handle. The handle: The Donic Dotec model has a totally different handle to previous bats.The handle is made out of one piece, surrounded by natural cork. There are different versions for right and left handers. Waldner Dotec AR: The Limba / Balsa combination produced by the new Donic Dotec Technology, results in a perfect, relatively speedy, all round blade. The touch is amazing when returning the ball. One cannot experience better control inside the Donic Dotec range! 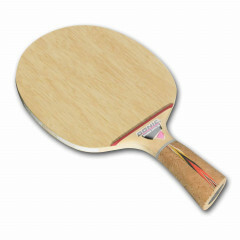 Donic Blade Waldner Dotec AR is beeing added to cart.